Green tea month..!! I still have half a bottle of green tea powder. 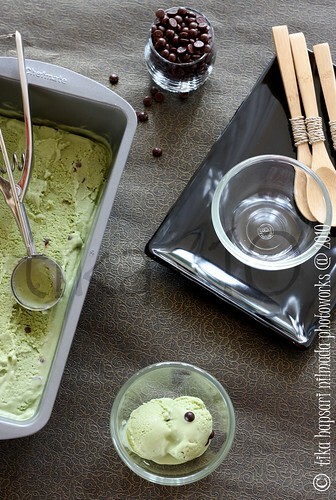 So come on, to chill your day out, let's make green tea ice cream. I made this from the scratch. To be honest, it's my first time making ice cream from scratch. And you know what..?? It was fun !! I never thought it would be so easy. 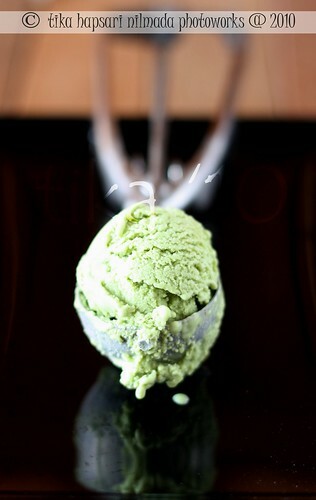 When I tell my son about my plan to make green tea ice cream, he said "oh no....not green tea again !". I was laughing out loud. He already bored with green tea. But I kept going on with my plan on making ice cream. Well, in this recipe I made this without ice cream maker, that's because I don't have one. But don't worry, you just need to mix the mixture couple of times. But it's worth it ! 1. In a small bow, mix the green tea powder with hot water. Set aside. 2. Lightly whisk egg yolks in a pan. Add sugar in the pan and mix well. 3. Gradually add milk in the pan and mix well. Put the pan on low heat and heat the mixture, stirring constantly. 4. When the mixture is thickened, remove the pan from the heat. Soak the bottom of the pan in ice water and cool the mixture. 5. Add green tea in the egg mixture and mix well, cooling in ice water. 6. Lightly whip the cream and then add it to the cold green tea-milk mixture and stir gently. 7. Transfer the mixture to a large container and put it in the freezer. As ice crystals start to form, remove, and mix well with a spoon to break them up and return the mixture to the freezer. Repeat this a few times as it freezes to ensure that the ice cream is smooth. The ice cream is very rich and creamy. I am very happy with it and will definitely make again. Holidays ..... who hates holiday ? Students, kids, fathers, mothers, even me who works as an employee loves it. 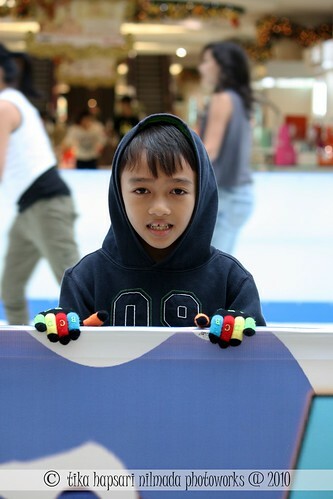 So, when holiday come, I took my son to one of mall in South Jakarta, to play ice skating. This was his first chance to try it. He had so much fun there. I always love holiday, after 5 days doing things on my work, I can relax myself with cooking, photographing and also spending time somewhere with my family. Nothing compares to that. 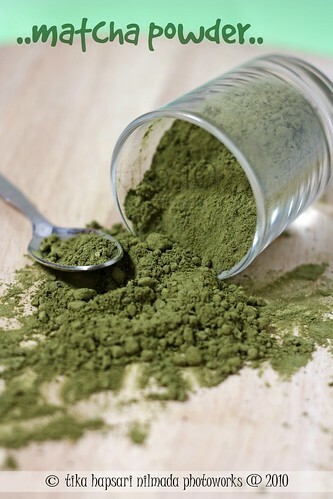 At my own tiny kitchen, I'm improvising to make anything with green tea powder. Green tea smoothie. Once I drink my first green tea smoothie was at Oh La La Cafe. I like the sensational taste of green tea. I love how it smell. Magic powder. 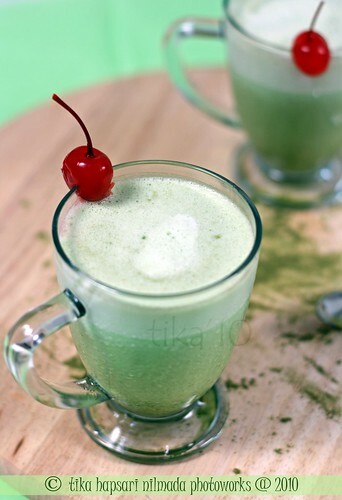 My version of green tea smoothie is a mixture between milk, sugar, green tea powder and ice cubes. Then blend all the ingredients in a blender until smooth. Serve it in a glass. Grab a book, sit relax on a couch, take a deep sip of green tea smoothie. Yum !! Do you see that green color ? Fresh ! For my eyes and also my throat. Just try, I hope it gives freshness to you as well. I found this steamed cake recipe from an old magazine. The original recipe is "Three-flavors Coconut Milk Steamed Sponge cake" (chocolate, plain and mocha), but I change the mocha flavor with green tea flavor. Besides, steamed cake in a magazine was steamed in a large cake mold. But I want to make this cake as cupcakes. So here's the recipe. 1. Beat eggs, sugar, salt and emulsifier until fluffy. Shifted flour and baking powder. Fold in flour and coconut milk into the egg mixture alternately until well combined. 2. Divide dough into 3 equal portions. Set aside one portion for plain flavor. 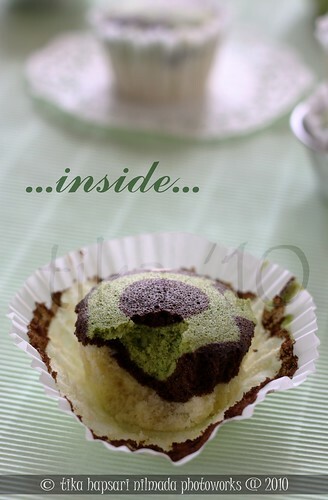 Add the two portions with chocolate paste and matcha powder. Mix well. 3. Pour every batter into the cupcake molds that have been given paper cups using spoon. It's all up to you, if you want to make it layer by layer with different flavors is fine. 4. Steam for about 20 minutes on medium heat until cooked. 1. Kocok telur, gula pasir, garam dan emulsifier sampai mengembang. Masukan tepung terigu dan baking powder sambil diayak dan diaduk perlahan bergantian dengan santan kental instant. 2. Bagi adonan. Satu bagian tambahkan 1/2 sdt pasta coklat, satu bagian tambahkan 1/2 sdt matcha powder dan satu bagian lagi dibiarkan putih. 3. 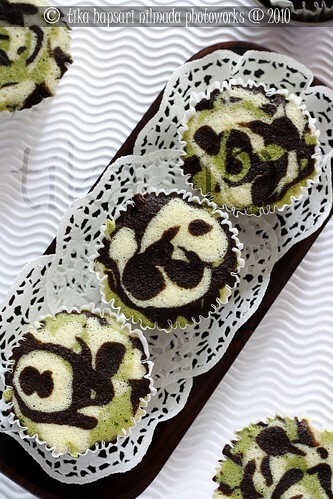 Tuangkan ke cetakan cupcake yang sudah dialasi kertas cupcake. Anda bisa mencampurkan ke tiga adonan tsb ke dalam cetakan. 4. Kukus 20 menit dengan api sedang sampai matang.